These stocks have dividend yields averaging 5.7%. Yet very few retail investors own them. That’s a shame. It means you’re probably leaving a lot of (predictable) money on the table—a thought income investors should cringe at. As I’ll explain shortly, today’s interest rate environment makes now a great time to buy preferred stocks. Congress just activated a $1 trillion “emergency fund” to address this problem. It’s designed to pay out as much as $185,040 to people like you -- on top of your normal benefits. All you need to do is follow these simple steps to stake your claim on a slice of this $1 trillion “emergency fund” right now. Click here to read more! When you own preferred shares, you own a slice of the company. And the value of that slice—the share price—can go up or down over time. It that sense, it’s just like owning common stock. Note that not all publicly traded companies issue preferred shares. It’s most common among banks and other financial firms. Also, you don’t need to jump through any special hoops to buy preferred shares. They’re accessible through an ordinary brokerage account. Preferred stocks tend to be much more stable than common stocks. This is a key advantage, especially for income investors looking to minimize surprises. 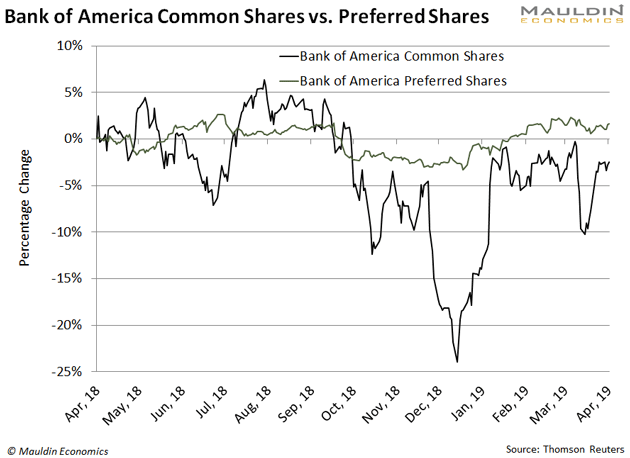 Take a look at Bank of America’s preferred and common shares over the past year, for instance. Its preferred shares (the green line in the next chart), fluctuated a lot less than its common shares (the black line). Preferred stocks also offer much higher dividend yields than common stocks. 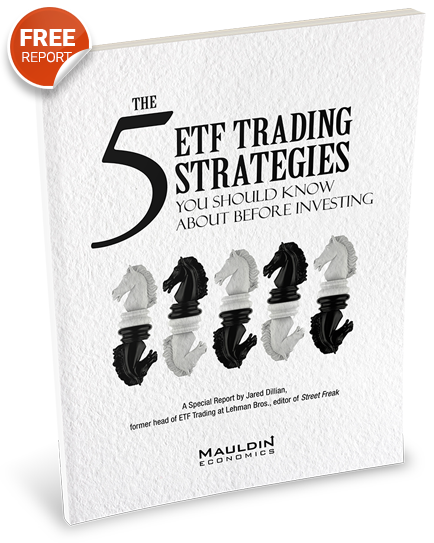 Take the iShares Preferred Securities ETF (PFF), for example. It’s a good proxy for preferred stocks in general. As you can see in the table below, PFF’s dividend yield is almost two-thirds higher than the yield on the iShares Select Dividend ETF (DVY), our proxy for high-dividend-paying common stocks. PFF’s yield is also over three times higher than the yield on the S&P 500. On top of that, preferred stock dividends are also safer than common stock dividends. Let’s circle back to our Bank of America example. At the moment, Bank of America common stock pays a dividend of $0.60 per share. Now, say the company hits a rough patch and cuts that dividend. This would be bad for investors holding common shares. But it wouldn’t affect those holding preferred shares. Remember, preferred stocks pay a fixed dividend, usually every month or quarter. Again, this makes them a bit like bonds. And the company has to satisfy these payments before it pays a dividend on its common stock. Like bonds, preferred stocks are also very sensitive to interest rates. When interest rates go up, preferred stock values go down. The opposite is also true. When interest rates go down, preferred stock values go up. Now, imagine this $4 annual dividend translates to a 5% dividend yield. And, when you bought your preferred stock, the 10-year Treasury note was yielding 1.5%. At that point, you were sitting pretty. Then the Federal Reserve decided to raise interest rates. This increased the yield on the 10-year Treasury note to 3.0%. Since the 10-year Treasury yield, which comes virtually risk-free, shot up, but the yield on McDonald’s preferred stock stayed at 5%, your McDonald’s preferred stock is now less valuable. That’s not good, which is why you need to pay close attention to interest rates before buying preferred stocks. If you own preferred stocks, interest rates are your friend right now. The Fed kept interest rates near 0% from 2008 to 2016. This made it much cheaper for businesses to borrow money, pushing up the prices of things like houses and stocks. Then the Fed started to hike interest rates. This continued for nearly two years. Eventually, the weight of higher rates—and the Fed signaling they would head even higher—became too much to bear. The combination sent stocks plummeting 20% from October to December last year. The big market selloff seemed to spook the Fed into abandoning higher interest rates. At this point, I’m confident the Fed won’t raise interest rates for at least another two years. If anything, I think we can expect lower rates within that timeframe. This all bodes well for preferred stocks. I think they’re more attractive now than ever. Agree that the Fed is likely to hold Fed Funds rates low. But low Fed Funds rates spur growth, and with labor markets tight, that leads to inflation. Higher inflation then leads to higher rates on the long end of the interest rate curve, where preferred stocks reside. Fed will stimulate the economy and the stock market until the 2020 elections, and that will lead to inflation.